Recently launched Half Acre marks the birth of something new in Melbourne; a chameleon of spaces that will be ever-evolving and activated with community engagement at its core. Named after the sheer size of the land located in the industrial neighbourhood of South Melbourne, Half Acre unites an all-day eatery, a bar and a unique event space for private and communal functions. Owners Adam Wright-Smith (ex-Fat Radish, Silkstone NYC), Leigh Worcester and Asaf Smoli (food&desire), all with strong hospitality backgrounds, found the space whilst driving past one day. Although it was dilapidated, they saw its true potential. Adam is at the forefront of this new South Melbourne experience and brings a slice of New York City to the venture. The eatery, which is set in a beautiful “glasshouse” has indoor and outdoor spaces surrounded by exposed brick, along with heating to be accessible and inviting throughout all of Melbourne’s ever-changing seasons. A unique and eclectic space, the eatery transports guests on an unmatched journey before arriving for a wholesome dining experience of seasonal produce, sourced locally. Under the guidance of Head Chef Eitan Doron (originally from Israel), the kitchen is in safe hands. Everything is prepared in an open kitchen setting, allowing each guest to engage with the menu through sight and smell. 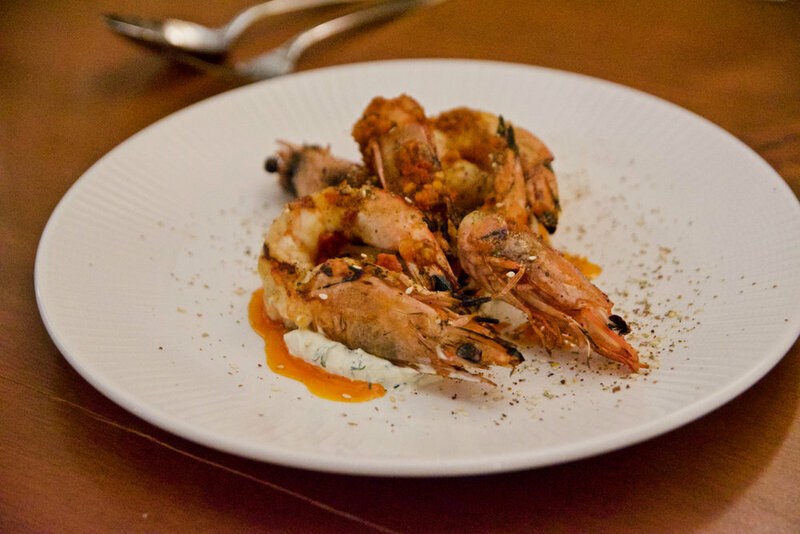 We loved tasting our way through Half Acre’s menu which is designed for sharing and focuses on fostering seasonal Australian cuisine cooked over wood fire coals. Our top picks from the menu are the vegetarians dishes. Yes, you heard right. These guys know how to do their veggies. Think grilled cabbage served with torched goat cheese and chimichurri or the stunning oven dried tomatoes laced with stracciatella, burnt chilli, basil and olive tapenade. Just yum. For meat eaters there is also a lot to love. The scotch fillet is a winner. Displaying a mastery in the manner the steak was cooked, our inch thick cut of beef was cooked perfectly from end to end. A light searing ensured that it was lined with a thin crisp layer packed with caramelised beef flavour. For something lighter there’s the roasted cauliflower with dukkah and tahini as well as the flathead fillet served with pickled carrot and okra. Both beautifully cooked and busting with flavour. Dessert time continues to please at Half Acre. Whatever you do make sure you try the Woodfired pineapple with pecan crumble and yoghurt ice cream. You can thank us later. With an increase of apartments in the industrial area of South Melbourne, Half Acre is perfectly placed as a locals ‘home away from home’, an inviting and welcoming space from open to close.